Add to cart the livre of Sharma Kailash K.
Optical technology is essential to communications and medical technology. K.K. 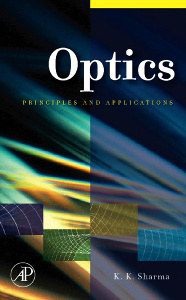 Sharma has written a comprehensive volume on optics. Beginning with introductory ideas and equations, Sharma takes the reader through the world of optics detailing problems encountered, advanced subjects, and actual applications. Elegantly written, this book rigorously examines optics with over 300 illustrations and several problems in each chapter. The book begins with light propagation in anisotropic media considered much later in most books. Sharma has started with this because it provides a more general and beautiful example of light propagation. Nearly one third of the book deals with applications of optics. This simple idea of merging the sometimes overwhelming and dry subject of optics with real world applications will create better future engineers. It will make ‘optics’ jump off the page for readers and they will see it take shape in the world around them. In presenting optics practically, as well as theoretically, readers will come away not only with a complete knowledge base but a context in which to place it.